This was a short two night cruise from Southampton, England with a call at Guernsey in the Channel Islands. Although Britannia had been in service less than six months, we were impressed by the beauty of this large ship and the efficiency of the operation. The voyage did not start out well. P&O Cruises has implemented a new embarkation procedure in which each guest is given a specific time to report to the cruise terminal for embarkation. The idea is to improve passenger flow so that when a guest arrives at the terminal he or she can go directly aboard and his or her cabin will be ready. There are several flaws in this concept. First, if a guest has spent the night before the cruise at a local hotel, he or she will most likely have to vacate their room by noon. As a result, he or she has no real choice but to go to the cruise terminal and wait for his or her embarkation time, which could be in the late afternoon. Second, if a guest is coming from a distance, he or she must leave home with sufficient time to take into account delays in traveling to the port such as traffic jams on the motorway. If no such delays occur, the guest will have no choice but to wait in the cruise terminal until their assigned embarkation time. Finally, many people want to begin their cruise as soon as possible and like to arrive early at the terminal in order to have lunch and several hours on the ship before she sails. If such guests are assigned a late embarkation time, it will negatively impact their cruise experience. Whatever the reason, by a little after noon, there was already a large crowd in the terminal waiting to board. To allievate this, the ship began boarding earlier than scheduled. Still, there was considerable comment among the passngers about the wait and seeming chaos in the terminal. Stepping aboard Britannia, however, the experience in the terminal was quickly forgotten. The interior of the ship is beautiful. Its décor is like that of a contemporary upscale London hotel. The style is of the moment but not flashy or vulgar. In addition, the style flows through the ship so rather than being a succession of different styles, the public rooms have a unified harmony. Britannia is the sister ship of Princess Cruises' Royal Princess and Regal Princess. However, P&O Cruises did not simply take the Princess design and relabel the public rooms. Instead, it molded the interior to present its own style of cruise experience. For example, on the Princess ships, the atrium is a large open area that is used as both the central area of the ship and as an entertainment venue. On Britannia, the atrium looks like a hotel lobby dominated by a multi-story modern sculpture with seating arranged around the base as in a cocktail lounge. Both concepts work but the point is that they are different. Along the same lines, Britannia has a much smaller casino than on the Princess ships and a much larger pub style lounge. This reflects the differing tastes of P&O Cruises' British clientele and Princess' mostly North American customer base. Britannia's specialty restaurants also have a different focus. Whereas the Princess ships have the Crown Grill steakhouse and the upscale Italian cuisine Sabatini's - - both developed in-house, Britannia's specialty restaurants were developed in conjunction with outside celebrity chefs. The Epicurian Restaurant is a fine dining experience and Sindu is an Aisan-inspired restaurant. The Limelight is a dinner caberet that features visiting artists who perform nowhere else on the ship. The only real problem that we encountered with Royal Princess and Regal Princess was that there was a long wait for elevators, particularly with the midship elevator bank. On Britannia, however, there were no such delays. Unlike her Princess sisters, Britannia has a large number of single occupancy cabins. This rflects the success that P&O Cruises has had with single cabins on Ventura and Azura. The single cabins on Britannia are the best that we have experienced both in terms of décor and layout. Moreover, they are not in out of the way spaces but include a series of balcony cabins located high on Deck 16 with panoramic views usually reserved for suite guests. Britannia is targeted to the British market and almost all the passengers are British. Unlike Cunard Line, which presents a British experience that is the way foreigners think of Britain, P&O Cruises is contemporary British culture - - Britain at home. Inasmuch as this was a short cruise, there were many guests aboard for a short break or for a quick outting with a group of friends. Ages ranged from 20s to 60s with most people in their 40s or 50s. Very few children were aboard. We witnessed no bad behavior. 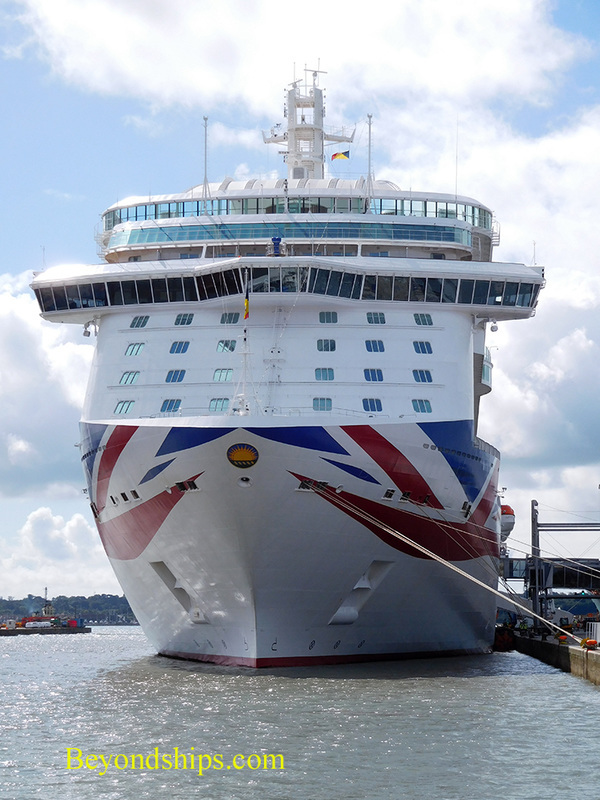 Much larger ship than any other P&O Cruises ship - - Britannia is the second largest ship in the Carnival Corporation fleet - - Britannia is not as intimate as some of the older P&O Cruises ships. However, the space is laid out well so as to create a number of relatively small areas. For example, the three main dining rooms are divided so that you do not feel that you are eating in a vast hall. Similarly, there was very little queuing except while for waiting for a tender to go ashore. One of the ways Britannia avoids crowding is by offering a number of entertainment offerings each evening. There is a show in the main theater, a film in the Studio, and an act in the Live Lounge as well as live music in several of the lounges. There are several performances of each so you can see more than one per evening. The theater is equipped with large LED panels that serve as the backdrop for the shows. Not only are these colourfully vibrant but they can be moved automatically during the performance to give different effects. This enhances the entertaining revue style shows put on by the singers and dancers. Speaking of entertainment, the in-cabin television gives passengers complimentary access to a large collection of good quality movies and television programs. The danger is that you could spend your whole voyage in the cabin. We were pleased with the food on Britannia. Consistent with P&O Cruises' overall approach, the menus are designed with the British market in mind. However, this does not prevent the ship from presenting a good range of choices for each meal. The Marco Pierre White recommendations in the main dining room such as his take on Beef Wellington were quite good. The service on Britannia was also good. The servers and room stewards do not socialize with the passengers to the same extent as on North American ships. Rather, the goal is to provide unobtrusive service. The consensus view among the passengers was that it seemed like a lot had happened in a short space of time. Most wished that the voyage had been longer.